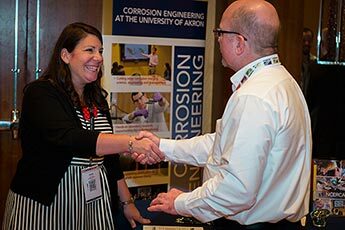 Attendees of the Western Area Conference want to learn about the latest products and services in corrosion prevention and mitigation. This gives exhibiting companies the opportunity to showcase how their products and services can be effective in assisting with these concerns. Exhibits are selling quickly. Contact the NACE International Sales Department today at sales@nace.org or by phone at +1 281-228-6411. Additional booth attendant registrations may be purchased for $350 USD. Sponsorships provide the opportunity for top companies to stay at the forefront of decision-makers’ and conference attendees’ minds. The Western Area Conference assists exhibitors with their brand awareness by offering additional ways to catch attendees’ attention through Sponsorships. For more sponsorship information, please contact Sales at sales@nace.org or by phone at +1 281-228-6446. Sponsorship must be sold by October 10, 2019 for fulfillment. *Sponsorship includes production of 200 tote bags. Sponsor responsible for providing giveaway item. Giveaway item must be approved by NACE. Sponsor may choose to ship giveaway item to NACE HQ by October 31, 2019, or sponsor can choose to bring to conference for distribution. Tuesday, November 12, 2019 | 5 - 7 p.m. Sponsorship includes production of cups. In the event that multiple sponsorships are sold, one sponsor logo will be imprinted per a cup and cups will be divided between total sponsors. Sponsorship must be sold 45 days before the conference date. Sponsor must provide sponsor representative 7 days prior to event date. Drink tickets are valid for wine, beer, soda and water. *Sponsorship does not include production of business card case. 200 business card cases must be approved by NACE and must be shipped to NACE HQ by October 31, 2019 or sponsor can choose to bring to conference for distribution. *Sponsorship must be sold by October 10, 2019. Sponsor responsible for providing giveaway item. Sponsor may choose to ship giveaway item to NACE HQ by October 31, 2019, or sponsor can choose to bring to conference for distribution. Sponsorship includes production of notebooks. In the event that multiple sponsorships are sold, all sponsor logos will be imprinted on each notebook. Sponsorship must be sold by October 10, 2019 for fulfillment. *Sponsorship does not include production of lanyards. 225 lanyards must be approved by NACE and must be shipped to NACE HQ by October 31, 2019 or sponsor can choose to bring to conference for distribution. Company advertisement included in the Final Program. 1 available for each position on a first come, first serve basis. Art materials due November 6, 2017. *Sponsorship must be sold by October 15, 2019. Art materials due October 17, 2019. *Sponsorship includes production of 200 coffee cups (full day break) and 100 coffee cups (half day break). Sponsorship must be sold by October 10, 2019 for fulfillment. *Sponsorship does not include production of pens. 220 pens must be approved by NACE and must be shipped to NACE Headquarters by October 31, 2019 or sponsor can choose to bring to conference for distribution. *Sponsorship must be sold by October 17, 2019. The Western Area Trivia Sponsorship will feature sponsoring companies, fitting onto (1) Trivia card, which will be provided to attendees at registration. Trivia cards will be produced to include all co-sponsoring companies. Prizes will be drawn during morning and afternoon break sessions. If Trivia card is not selected, attendee still has the chance to win the next prize on the following day(s) with the (1) card they submitted. *Must be a registered attendee. Must be present to win. Only one entry required. Attendees must complete the Western Area Trivia based on the questionnaire received. Attendees can go by each sponsoring booth to receive the answer to the trivia. Once trivia is complete, attendees will turn them at registration where NACE staff will verify trivia has been completed. *Minimum of 5 participating companies by October 10, 2019 to move forward with Western Area Trivia.